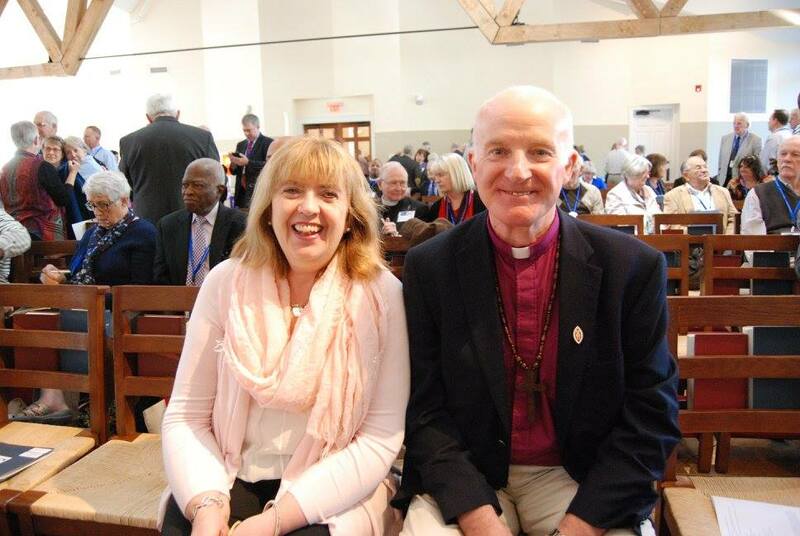 Bishop Robert Gillies and his wife Liz Gillies were our special guests, attending both days of Convention. 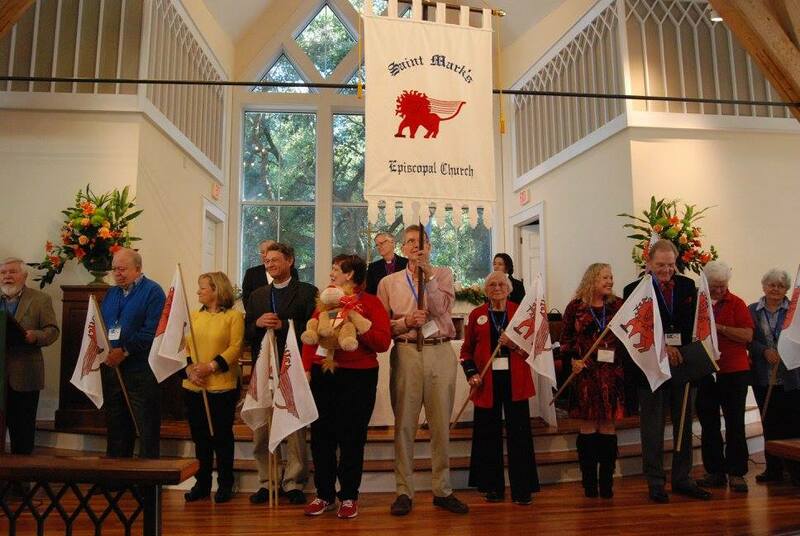 Episcopalians from across eastern South Carolina gathered at Holy Cross Faith Memorial Episcopal Church in Pawleys Island November 13-14 to celebrate “The Call to All” at the 225th Annual Diocesan Convention of The Episcopal Church in South Carolina. Bishop vonRosenberg said that people who are exercising their gifts in ministry in the diocese often tell him they have never worked as hard, or had as much fun. “As we live and serve as partners with Christ, we find a joy which is as wide as God’s mercy and as deep as God’s love,” he said. 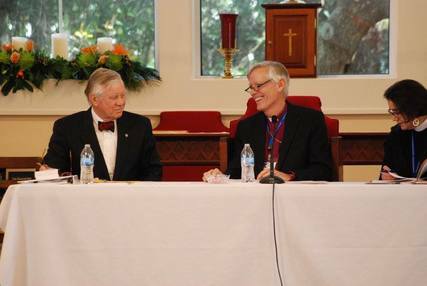 The gathering was the annual business meeting for the local diocese of The Episcopal Church and the Anglican Communion in eastern South Carolina. It was also a time of prayer and reflection, opening with a festive Choral Eucharist on Friday evening. Following the news of the attacks in Paris, the meeting reconvened Saturday for a service of Morning Prayer to offer prayers for the victims and for peace. As part of the diocesan commitment to outreach, the offering at the Friday night Eucharist, totaling $3,478, was designated for two flood relief efforts for South Carolina: the Black River United Way Flood Relief Fund, and Episcopal Relief & Development, the international relief and humanitarian organization of The Episcopal Church. The Convention also unanimously adopted two resolutions aimed at racial reconciliation. Resolution 1 calls for continued prayer for those affected by the deaths at Mother Emanuel AME in Charleston on June 17, and urges congregations in the diocese to follow Mother Emanuel’s example of love and forgiveness. Resolution 2 calls for a renewed commitment to racial justice and reconciliation, and directs the Diocesan Council to develop plans for training, community dialogue, internal examination, and the development of partnerships with other churches and institutions, reporting regularly to the Convention and diocesan leadership. 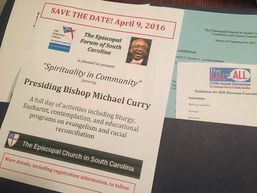 On Saturday, the church building echoed with applause at the announcement that the new Presiding Bishop and Primate of The Episcopal Church, the Most Reverend Michael B. Curry, will be visiting the diocese April 8-10, 2016. Bishop vonRosenberg was at Grace on Sunday, Nov. 15 for the announcement that Grace is designated as the Cathedral. 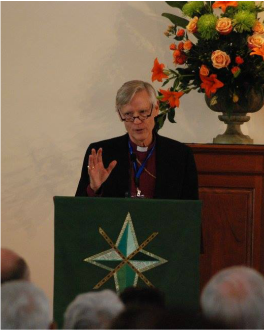 The Convention voted overwhelmingly to designate Grace Episcopal Church in Charleston as the cathedral of the diocese, to be known as “Grace Church Cathedral.” The change in Canon 17 affirms the current arrangement, in which Grace has been serving many of the functions of a cathedral since early 2013. Grace houses the offices of the Bishop and diocesan staff and serves as host for a variety of diocesan events. The word “cathedral” refers to the place where the bishop’s seat is located. 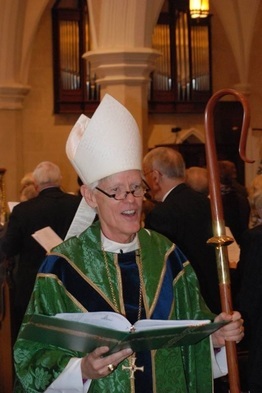 As the rector of Grace, Michael Wright becomes the Cathedral’s dean. 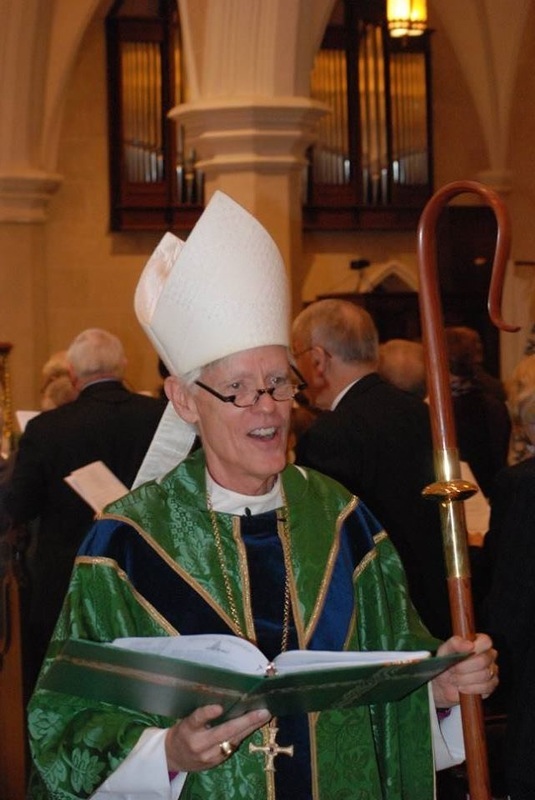 He told delegates that the new cathedral looks forward to serving the diocese, and issued an invitation to Grace for the 226th Annual Convention in November 2016. See a photo album of Grace's first Sunday as a Cathedral here. Convention-goers also celebrated a milestone for St. Mark’s Episcopal Church in Port Royal. 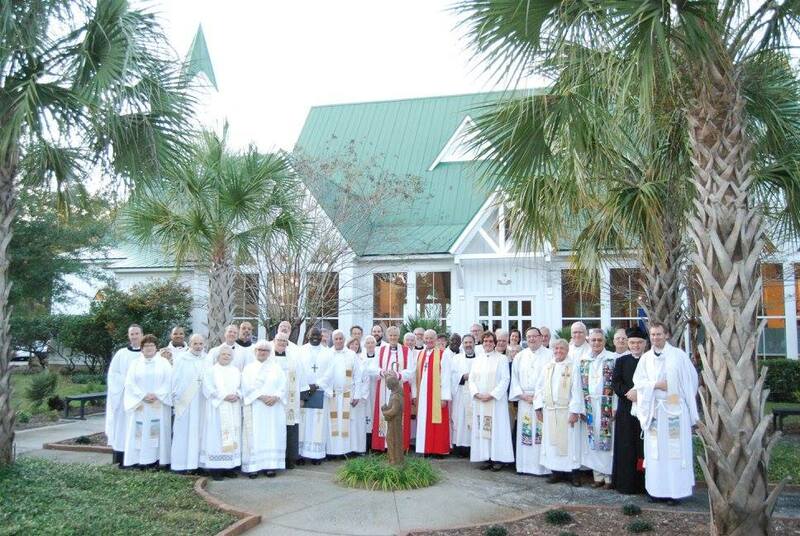 After significant growth in membership and resources, this mission church serving the Beaufort area applied for recognition as a parish of the diocese. The Convention approved the change by acclamation, welcoming a parade of St. Mark’s members into the church Saturday with a standing ovation. Delegates also adopted a 2016 budget. In a budget hearing on Friday, delegates called for a larger pay increase for diocesan staff than initially proposed. As a result, when the Reverend Dr. Jim Taylor gave the Treasurer’s Report on Saturday it included a recommendation for a 5 percent increase, up from 2 percent. The raise was approved along with the entire spending plan, without debate. Delegates said it was meant as an immediate gesture of support for staff, all of whom are part-time employees. A personnel committee currently is reviewing staff pay and job descriptions as part of future planning for the diocese, and expects to make further recommendations in 2016. The Convention approved Resolution 5, adopting a new Diocesan Alcohol Policy. It reflects changes passed by the General Convention of The Episcopal Church last summer, and lays out the procedures churches must follow if they choose to allow alcohol to be served at events. Standing Committee – Timothy Armstrong of Calvary Episcopal Church in Charleston was elected as a lay member on the first ballot in a five-way race for two seats; Barbara Mann of Grace was elected in a runoff. The two clergy nominees for Standing Committee were elected: the Reverend Mark Brinkmann of All Saints, Hilton Head Island, and the Reverend Dr. James T. Yarsiah of St. Philip’s Chapel and Voorhees College in Denmark. Diocesan Council -- Hillery P. Douglas of St. Mark’s, Charleston, and Pam Guess of Christ Church, Denmark were elected to the lay seats. The Reverend Pam Fahrner of All Saints, Hilton Head Island, and the Reverend Caleb Lee of Grace, Charleston were elected to the clergy seats. 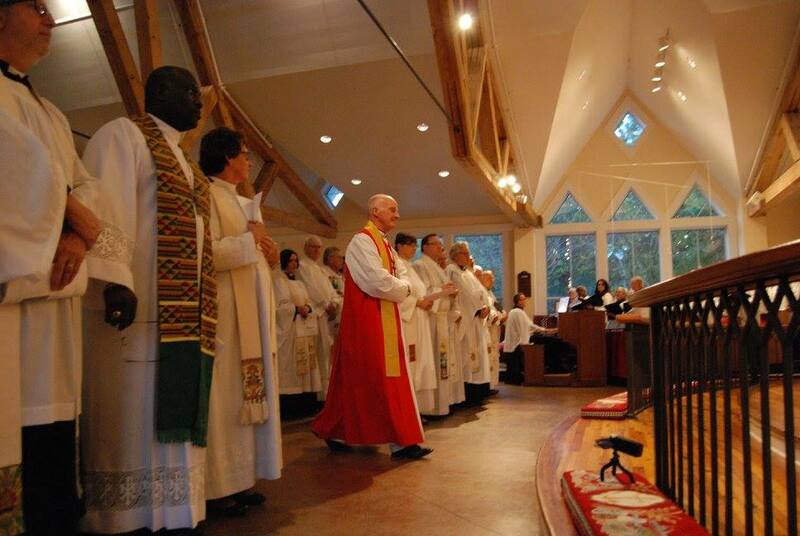 Sewanee Trustee -- The Reverend Wil Keith of Holy Cross Faith Memorial Episcopal Church was elected as a clergy member of the Board of Trustees of the University of the South at Sewanee. The Reverend Caleb Lee of Grace Church, Charleston reported on Episcopal Campus Ministry. An active college ministry is ongoing at the College of Charleston, with weekly worship and pastoral contacts for local students. Both clergy and laypeople are working to build the campus ministries at The Citadel and the Medical University of South Carolina. The diocese is also coordinating with the Diocese of Upper South Carolina to share information and resources for students at colleges across South Carolina such as the University of South Carolina and Clemson. The Reverend Alastair Votaw, Chaplain to the Retired Clergy, gave a report on the status of the dozens of priests and deacons who, though retired, are actively serving in most of the congregations as priests-in-charge, interims, supply clergy, and in other roles. Updates on diocesan institutions were delivered by Mary Jo Powers of Thompson Child and Family Focus (formerly York Place), and Danny Sanford of Still Hopes retirement community in Columbia. Written reports were received from other institutions of the diocese: Bishop Gadsden, Voorhees College, Porter-Gaud School, Kanuga, and the University of the South at Sewanee. Heard a report from Chancellor Thomas S. Tisdale Jr. on the status of legal action resulting from the actions of a group that broke away from The Episcopal Church in 2012. A decision from the South Carolina Supreme Court on property issues is expected to come in the next several weeks, but Chancellor Tisdale said that the future of the diocese is bright, no matter which way the decision goes. “Whatever fork the road takes, we will flourish in either direction,” he said. Participated in the installation ceremony for Frances Elmore, a member of St. Catherine’s in Florence, who was elected as Treasurer of the National Altar Guild. Approved Resolution 3 expressing gratitude for the ministry of the Most Reverend Katharine Jefferts Schori, who recently completed her nine-year term as Presiding Bishop and Primate of The Episcopal Church. Approved Resolution 4 honoring civil rights leader and educator Dr. Cleveland Sellers upon his upcoming retirement as president of Voorhees College, a historically black college affiliated with The Episcopal Church. Recognized the two seminarians from the diocese, Rob Donehue and Jason Roberson, who are currently preparing for holy orders, and heard a report on the Commission on Ministry on the status of others in the diocese who are seeking to become priests and deacons. Katie Mears of Episcopal Relief and Development led a workshop on Disaster Planning for churches. The Rev. Jemonde Taylor, Rector of St. Ambrose Episcopal Church in Raleigh, NC, led a workshop to help people identify their spiritual gifts. The Rev. Tom Long, the Bandy Professor of Preaching at Candler School of Theology at Emory University in Atlanta, led an all-day preaching workshop for clergy, focusing on the Gospel of St. Luke. Here are some online resources offered by our presenters. O God of the universe, Creator of all: In the midst of destruction and violence, mayhem and death, be present with and sustain the suffering; let the whole world see and know that even in the face of indescribable tribulation, your grace and mercy strengthen us. Bring peace, O God, and healing, to the city of Paris, and to the whole world; through Jesus Christ our Lord. Amen.